L etâ&#x20AC;&#x2122;s play with th e m ! Ra fa -ki ds is g l a d to p res e nt ima gin a r y a nd play f u l K desk. We desi gn ed this s tabl e a nd f u nc tiona l desk wi thou t c om p rom is ing i ts be a u ty. notebooks, iPad or little toys and treasures. 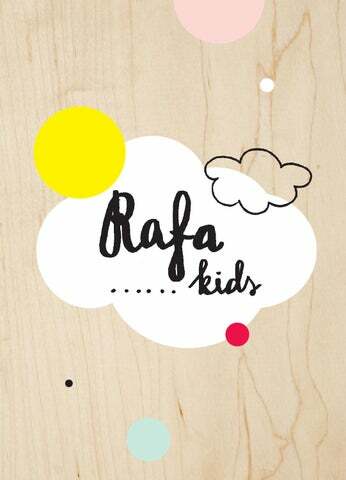 m e mber of R a fa - ki ds c oll e c ti o n.
We know well that moment in time when a child is outgrowing his crib is a huge step in his life. That’s why we created a bed that encourages child’s independence and also stimulates his growth through play. We see a child’s bed not only as a place to sleep but also as a challenging and beautiful element of his room. So here we go! A f unc tiona l , s a fe an d a t th e sa m e tim e good looking . wi th a grea t m a te r ia l e ff ic ie nc y.
for children age 3 or 4. Do your chi ldren sha re a s ing le room ? Th e youn ger on e would li ke to h ave a bu nk b ed and the older n eeds a teen bed a l re a dy ? 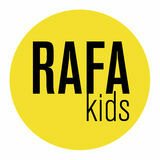 Then the Rafa-kids i s for you . a nd s a fe. a s well a s for ou rs elve s ! de si g ne d a n ew modern versi o n o f X s a nd O s ga m e .
Usin g the ma ke a c ross pa ttern o n a ny sur fa c e you wish a nd pl ay ! SIZE: 35cm x 35cm 45cm high MATERIAL: Finnish birch wood and plywood COLORS: natural X(N), whitewash X(W) and black X(B) FINISH: laquered or stained and laquered The stool is in one piece, no assembly required. SIZE: 155cm x 75cm 60cm high Mattress not included: 150x70 12cm high MATERIAL: Finnish birch plywood COLORS: natural R(N), whitewash R(W), dark chocolate R(D) FINISH: laquered or stained and laquered. SIZE: 205cm x 80cm 35cm high Mattress included: 200x75 16cm high MATERIAL: Finnish birch plywood COLORS: natural A(N), whitewash A(W) and dark chocolate A(D) FINISH: laquered or stained and laquered. SIZE: 205cm x 95cm 162cm high Mattress not included: 200x90 max.12cm high MATERIAL: Finnish birch plywood COLORS: natural F(N), whitewash F(W) and dark chocolate F(D) FINISH: laquered or stained and laquered. SIZE: diameter 23cm 3m long rope MATERIAL: 21mm FINNISH: birch plywood COLORS OF ROPE: black S(B), yellow S(Y) FINISH: laquered with rubber band. S e e you t h ere!